My answer to this would have to be Lt Cmdr Data!! He is my favourite character of all the series and I would love his speed, strength, memory and omputational skills! Had a pretty bad time of it last week. I seem to be fine for a while but then I have periods of downer moments. Suffering from depression is not fun at all!! I am normally rather emotional when watching TV etc and cry at the drop of a hat, but when I am going through a bad section, it is so much worse. I watched 4 episodes of John Barrowman's "Tonight's the Night" and bawled my way through them. Not the tears that I normally have, but gut wrenching sobs for the whole 4 hours. The thing is that the show is really sweet... I was bawling because nice things were happening to people. By the end of the 4 eps, I had cried so hard that I actually couldn't see. My eyes would not focus and I had a headache. Even after a sleep I still felt absolutely rotten and it took 2 days to fully recover from the crying jag. This was even with my meds! The apathy and procrastination that accompany these downer periods meant that I got nothing done at all which just leads to frustration and anger at myself. I know it isn't my fault, but I still get annoyed at myself. I then have periods where I am almost normal again so this makes the downer times feel so much worse. I may have to go and actually get stronger meds if it gets worse again. So far I have been managing with just the natural stuff (St John's Wort) but it is not working like we had hoped... At least it has helped my Middle Insomnia that is a part of my depression! Was feeling good yesterday, so hopefully after my sleep today that will continue and I will actually get something done on my two days off!! Not holding my breath though! To all the Father's out there (especially in Oz) Happy Father's Day. I did my duty and called my Daddy up to have a chat. He lives a 10 hour drive from me and so I don't see him very often. In fact the last time I saw him was 2 years ago because I am a casual worker and don't get paid holidays and can't afford the time off without any income. Also the airfare is over $300 as there are no other airlines flying there so no competition. Unless a miracle occurs, it will be another year before I see him again. Of course we get on so much better when we are this far apart as we are too much alike and end up yelling at each other if we are together for more than a few days!! I do love my dad, but it is better from a distance! Anyway it is bedtime now so that I can get up to go to work tonight. Went to Westmead Hospital today to visit my friend Mick who had a colonectomy on Friday. He is fairly good spirits for someone who had a major operation! We had a good chat about various topics before I got kicked out at 2pm because visiting hours were over. Because it is a high dependency surgical ward (Surgical ICU) they are pretty strict about the hours. Of course I am now very tired as I am usually sleeping during the time I went visiting!! Tomorrow I will be heading into Bondi Junction for a 1 hour massage. I haven't had one for so long that my knots have several generations of knots on them! My back has been giving me hell for a while now so I am looking forward to the massage greatly. In fact as I typed this, I received an SMS from the clinic reminding me that I have an appointment at 9:30am! When I told one of my friends that I was going for a massage she looked shocked and said "just a massage though... at a massage parlour?" I don't know why she thought I was going to one of those places!! The appointment is at an Osteopath clinic not a thinly disguised bordello!! Realised today when I discovered just how long I had been neglecting my journal that I had not posted the latest tattoo here (which I got in March!). Hopefully in the next few days I will put up the pictures, and probably do a repost of all the others as well. Can't wait until I have enough money to get the next two done. The next one will a portrait of the Chris Pine version of Kirk, and the other will be the Zachary Quinto version of Spock. So that means I will have those two joining up with all that are already there - Karl, Brent, Connor, Dominic, Sid, and Garrett... along with the Enterprise D! Anyway I am off to bed for a few hours and then have to cook my meals for the next few days, catch a few more hours nap and then go out. Considering I have to work tomorrow night I need as much sleep now as I can get! I have been in LJ every day, but have been ignoring my own journal! That is the problem with being involved in too many things. My time keeps being taken with Facebook, Twitter, email, and catching up on fanfiction in some of my newer fanfiction communities. Caught up in one group, but am slowly going through kirk_mccoy now. Am only up to November 2009 at the moment. That and the fact thaqt some of the authors I follow are quite proific and when they post new fics I have to drop everything and read them which puts me even further behind. I need more hours in the day and less time having to go to work!! If it wasn't for the expensive Convention habit I have to support I would do less shifts at work and have more leisure time! Last night was just one thing after another. The storm that came through was pretty vicious and I was scared that my skylight in the bathroom was going to shatter. Not only was there heavy rain, thunder and lightening, but we also had hail. Half of my house has a tin roof so you can imagine the noise! 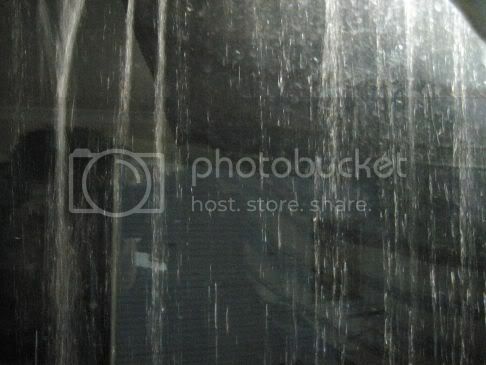 I took a photo of the rain pouring down across my door as the gutter leaks along that section. I turned on the outdoor light to get the photo, and after I had finished I noticed the wtare was pouring through the flourescent light! I immediately turned off the light and thought "that's not good". Went back to check on it a bit later as it hadn't actually turned off and I noticed thatthere was a torrent of water running out of my light switch inside the house! When I say torrent I mean torrent! Immediately turned off the lounge room light too. It went out, but a few minutes later it came back on. Now I know electricity and water do not go well together and I am starting to get a bit freaked. Next thing, I could smell smoke, and as my windows were all shut it had to be from inside. Sure enough, the light switch was now sparking and smoking. I was really freaked now! Went next door to see if they had a CO2 extinguisher, but they didn't, so I rang the fire brigade. Of course I actually work for 000 so I had to call my work to get the fire brigade! The fire brigade came out and ended up removing the fuse for my lights, but leaving me with powerpoints, That temporarily fixed the problem but now I need repairs done. I spent the night using the Telly and laptop as my light sources for the house. Then to top it all off, while I was sitting in the dark I glanced up at the wall and there was a huge huntsman spider there! I am severely arachnophobic and so that finished me off completely. Overall it was not a good night. I was actually supposed to be at work last night but I couldn't leave in case the house decided to actually catch alight. 10:33 pm - In total Squee Mode! I have been in total Squee mode for most of this week since discovering that (barring anything cropping up) Paul McGillion will be at Armageddon this year!!! I already had my Gold Ticket and so was going anyway when I found out. I have been bouncing around like a madwoman for the week and feeling quite giddy. What I am really looking forward to is getting another hug from him as he gives the best hugs ever! I still get giddy thinking about the last hug I had from him! You really should not watch a documentary on Hiroshima (with interviews with survivors) when you are already feeling low. Especially with very visual recreations interspersed with actual footage. Pay It Forward: I will send a small gift to the first 10 people who leave a comment here on my LJ. I don’t yet know what that gift will be - it could be anything: cloth, metal, paper, wood, a crystal, jewellery, silk painting, a story anything goes - but you will receive it within 365 days. The only thing you have to do in return is "pay it forward" by making a similar agreement on your blog. I finally admitted to myself last night that I have been suffering from depression for a while now. I have been writing off the various symptoms as "normal" but looking back now I can see that I have been falling for quite some time. I have always been fairly emotional when watching TV and movies etc, but lately I have found myself just busting into tears at the drop of a hat for no reason whatsoever. Last night I spent the entire walk from the train station to my house (1 hr) bawling my eyes out and couldn't stop. Usually after a good crying jag I would feel purged, but now I just feel numb. Things that should be getting an emotional reaction from me have no effect and things that should not affect me at all have me bawling like a baby. My grandparents are dying and my aunt is going in for a double bypass today and I feel nothing and yet finding out that the club taxi had stopped running 2 hours before had me bawling hard for 2 hrs. Even now I know that anything will set me off again. I have not been eating much as I can't be bothered cooking anything. I can't bring myself to do anything. I have no motivation at all and I spend hours trying to sleep but keep waking up every couple of hours. I have always been a procastinator, but lately it is just so bad that I get nothing done at all. My house is a total mess and I can't bring myself to care. What has helped trigger this depression is the severe financial stress I have been in for over 2 years now. Also the fact that my car has been off the road for 8 months and there is very poor public transport in my area. I have been trying to cope but slowly things have been overwhelming me until I have got to the point that I can't cope any more. The fact that there is no solution to my financial hardship in the foreseeable future means that I can see no ray of hope. I am crying again just writing this. I am so sick of feeling this way but know that it will be a long time before anything will change. The only thing I can count as "good" is that I have never felt suicidal at all... even at my lowest. 8:08 am - Another meme... It made me chuckle. I don't really know how to tell you this, but I dislike you. I think I realized it when I tripped on sesame seeds in your closet and I saw you knock out my John F Kennedy statue. I'm sure you're ashamed enough to understand that we're cousins. I'm returning your memories from the military service, but I'll keep your left ear as a memory. You should also know that I told my psychiatrist about our friendship. 8:16 pm - Sugar avoidance and other stuff! Even 2 days after the dessert night, I am still avoiding sugar. I have a craving now for savoury foods! The night was good though. We had Chocolate cheesecake, blueberry cheesecake, eclairs, choc chip bread and butter pudding (which turned out yummy! ), chocolates, wagon wheels, danish chocolate biscuits, choc dipped strawberries, choc poco sticks and some other assorted stuff. There was still heaps left by the end of the night. I am in an internet cafe as it is sunday and the last bus from my home leaves at 5:42pm but I don't actually start work until 11:30pm!! Same thing will happen tomorrow as it is a public holiday and so buses run on Sunday timetables. I really, really miss my car, but I just don't have a spare $1000 to register it and $1044 to pay the fines (for driving unregistered) and get my licence unsuspended. A lotto win about now would be very useful!! Oh well... I am now going to read some torchwood fanfic to help cheer me up!! 7:51 pm - Yummy cooking! On a day that is already quite warm, I am doing some baking! Tonight at work we are having a dessert night. I am baking Chocolate Chip Bread and Butter Pudding. Yummy! I just adore Bread and Butter pudding. I have never had a choc chip version before so i am curious to how it turns out. This morning I discovered just how loud the 2 smoke alarms in my house are! I work nights and even on my day off, I keep the same routine. For dinner (at about 4:30am) I was cooking some sausages in the griller when I suddenly had a craving for chips. I had 2 potatoes in the fridge and decided to slice them really thinly and fry them. They were sort of half-way between chips and crisps. I put the oil in the frypan, then sat right beside the stove to cut the potato. I had almost finished when suddenly I heard the dreaded "woof" sound and looked up to find the frypan on fire! This quite shocked me as it is an electric stove rather than gas and it has never done it to me before. I don't have a fire blanket or an extinguisher in the kitchen (which I know I should) and so I had to open the front door and chuck the pan out onto the concrete! I then had to open every window in the house (It is damn cold!) and keep fanning the smoke detectors so that they turned off. Now I am cold, but I did get my chips as I just put another pan on and started again! I feel sorry for the family next door as we share the kitchen wall! There is no way they could have missed the alarms going off! 11:51 pm - I am a Geek!! No surprise here!! I am a little surprised that my nerd scores were so low in comparison, but I have always considered myself a geek! Wow... This was a very in-depth questionnaire. Everything I have always done makes me Gryffindor. That is just so cool for me! 8:12 pm - Torchwood Fanfic: Consequences (Jack/Ianto) Death Story. Notes: I was at work when this depressing Bunny bit. I made myself cry while writing this so if you do read it, have a box of tissues on hand. There is a mention of mpreg. Warnings: DEATH STORY. This is not a happy story. Main character death. Spoilers: Mention of 2:13 Exit Wounds. Hopefully some more of my flist will get behind this. It is definitely a worthy cause.